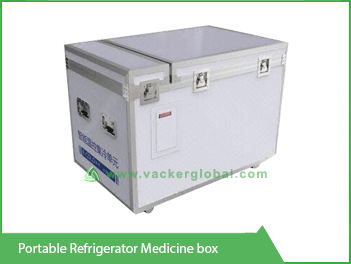 Refrigerated cold boxes are used for transportation sensitive items such as medicines, vaccines etc. when transported inside a van, car etc. These are small refrigerators which work on 12 V DC or 24 V DC, depending upon the model. The cold box can be connected to the DC power supply inside the car and it will work as a refrigerator. Also it comes with an adaptor which converts 230VAC or 110VAC to 12 / 24 VDC. So if you want to connect the box while inside your office or warehouse, you can use this adaptor to connect to a 230 V / 110 Volt power source depending on your country. 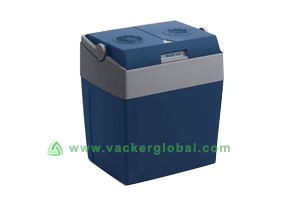 The portable freezers are capable of achieving temperature below 0°C upto -20°C. Special models are available to achieve temperature upto -40°C. A car freezer will take 30 to 45 minutes from startup to achieve a uniform temperature below 0°C. For sensitive material such as medicines, vaccines etc., it is preferred that the box be started in empty condition and load goods after attaining the desired temperature. This is called as precooling. Why portable refrigerators are known as active boxes? As external energy is supplied to a car refrigerator or car freezer, these boxes are known as active boxes. The boxes carry out cooling down as well as retaining the cold temperature inside. Boxes without a refrigeration unit are known as passive boxes. After closing the door, how long will it take once again to achieve the desired temperature?